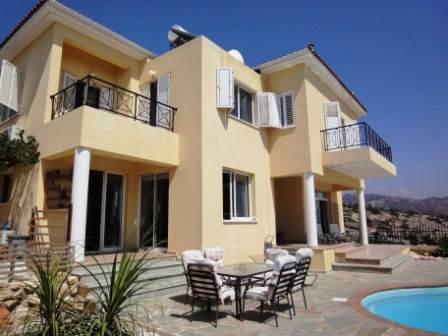 Cyprus Property Blog by Cleo : Absolute Bargain in Peyia - 4 bed - Sea Views - Title Deeds - Only 250,000!!! Title Deeds - Bargain Price!! Peyia, Paphos - This spacious 4 bedroom villa is located high in the hills of Peyia, not far from the village centre with it’s many local amenities such as supermarket, post office, shops and restaurants. Coral Bay with it’s golden sandy beaches, and the scenic Akamas peninsula, are a short drive away. What is particularly special about this property is that there are superb sea and mountain views from every room. Steps lead down from an entrance hallway to the lounge with corner fireplace, and patio doors open on to a covered veranda. There is a step up to the central dining area and huge end kitchen with granite worktops and plenty of cupboard space, and patio doors accessing a second covered veranda. A separate utility room off the kitchen provides further storage space and housing for the washing machine and dryer, and there is a guest toilet off the entrance hallway. A central winding staircase leads to the 4 double bedrooms, all with fitted wardrobes and balconies. The master bedroom being the largest has a large en-suite shower room and a balcony facing the sea. The views from here are to die for. There is also a good size family bathroom. There is plenty of space outside to relax. Covered verandas provide shade if required and a paved terrace surrounds the kidney shaped swimming pool. Here is an ideal place to enjoy food cooked on the outdoor grill, watch the sun go down, and the lights of Peyia and Coral Bay twinkle in the night.